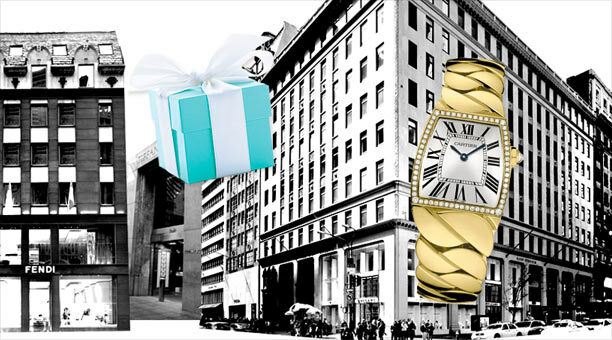 Every city has one - a retail thoroughfare that houses the most exclusive stores. Real estate slowdown or not, these luxury corridors are still thriving - for now, at least. Hot spot: Intersection of 57th Street and Fifth Avenue. Rent: $1,500 per square foot. State of the market: Wall Street may be melting down a few miles south, but rents on New York's prime retail corridor, Fifth Avenue between 50th and 58th streets, hit a record high this year. With that kind of overhead, some retailers tend to view their stores here as expensive billboards instead of merchandise movers. But others, helped by a crush of European tourists, are raking it in: Tiffany's Fifth Avenue flagship saw sales of $7,500 per gross square foot last year, 10% of the company's total revenue.